Location of the Kvichak River sampling site. The Bristol Bay area of Alaska supports the largest sockeye salmon fishery in the world. Abundance estimates of out-migrating smolts are used to prepare preseason forecasts of adult returns, set escapement goals and gain a better understanding of the population dynamics of this anadromous species. 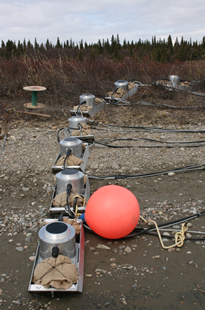 We have worked together with the Bristol Bay Science and Research Institute, LGL Alaska and Scientific Fisheries Systems, Inc. to develop and evaluate a system of up-looking sonar arrays designed to enumerate out-migrating sockeye salmon smolts. Our contribution to the project focused on hardware design criteria, site selection, assistance with sonar setup, and data processing and analysis. The sonar system that was developed in this effort consists of a series of single beam transducers placed along the bottom, across the river. Data processing and analysis was done with Echoview and involved visual editing of noise events (boat wakes, ice floes and noise from wind and rain), followed by an automated process for echo integration and the exporting of the tabulated results. The smolt density measured over each transducer was summed for all depth strata sampled, then multiplied by the water velocity (as an approximation of smolt velocity) to convert to smolt flux. 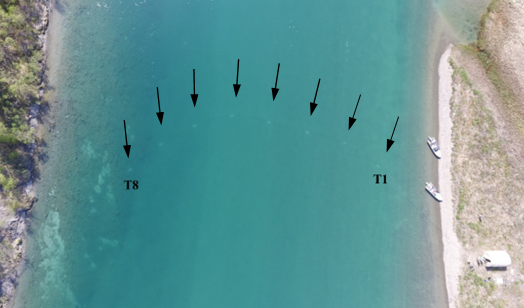 Summed estimates of smolt flux were then expanded to account for the unsampled area between transducers to provide an estimate of the total number of out-migrating smolts. Overhead view of one of the sampling sites. The arrows point to each one of the eight transducer pods in the array, faintly visible as light-colored objects in the water. Photograph by Jace Bures, LGL Alaska. Echogram examples of the data collected at this site are shown below. Echograms plot acoustic data in range over time. The solid red line of echoes along the top are the strong echoes reflected off the water surface. Depth increases from top to bottom. The thin horizontal lines mark 20 cm depth increments. The two examples illustrate the typical diurnal pattern in smolt schooling behavior: loose schools at night, tight schools during daylight hours. Echogram of smolt schools passing at night. Echogram of smolt schools passing during daylight hours.